The boys had their AWANA awards night on Wednesday June 3. (If you don't know what AWANA is, visit http://www.awana.org/). The boys worked hard all year to earn every bit of recognition they received. Aaron got the final plaque for Sparks and will be moving up to TNT next year. Great work! Katie Cornell graduated from high school on Saturday June 6. She actually mentioned us as having an impact on her life as her first Sunday school teachers from way back when she was in the 1st and 2nd grade when we were quote "young" as she said. She also mentioned Arich and Syble Harrison as having had a profound impact as her 5th and 6th grade Sunday school teachers in getting her to be daily in the Word (Harrisons, I hope you're reading this!). Doesn't Katie look beautiful? We still see her as the little girl in our class. There was a youth going-away-party for the Crossons at the Dunn's house on Sunday, June 7. 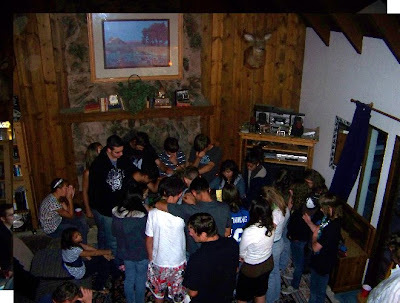 Here you see the youth all laying hands on Geoff and Nicia (they're in there somewhere!). It was a bittersweet time filled with laughter and tears and seeking the Lord. After a similar time of prayer at CCLA services, we had an official church party. We will miss you, Geoff and Nicia! Wow, so much going on. Thanks for keeping us posted. Give our congrats to the boys, and Katie for us, and blessings to the Crossons. Love ya both!